Conservative candidates had a strong showing in the county's elections but Labour managed to hold Lincoln. 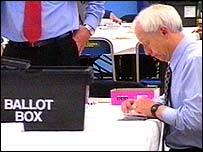 But one of the biggest shocks came from the Spalding area where the council leader lost his seat. The Conservatives gained an additional nine seats to take outright control of South Holland. But their success was overshadowed by the loss of Eddie Poll who was beaten into last place in the Weston and Moulton ward, behind the county's only British National Party candidate. There was a strengthening of the Conservative majority in North Kesteven - increasing their share of the 40 seats from 15 to 18, at the expense of both Labour and the Liberal Democrats. There was no change at Lincoln where all 11 seats up for grabs were held by Labour. It was a success for a trial of all-postal voting in the city where voting went up from 26% last time to a staggering 47%. In West Lindsey no party has overall control. The Conservatives gained four seats and retained their position as the leading party with 17 seats in total. Labour lost two seats and the Liberal Democrats lost one seat, leaving them with 12 and the Independents are down to six. In South Kesteven, the Conservatives are now in overall control after gaining two wards to make 31. Labour and Independents went down to but the Liberal democrats gained two. In East Lindsey, the Independents lost seven seats, and overall control of the council. The Conservatives gained seven seats. There was little change at Boston - but an alliance of the Conservatives, Liberal Democrats and Independents lost one member.